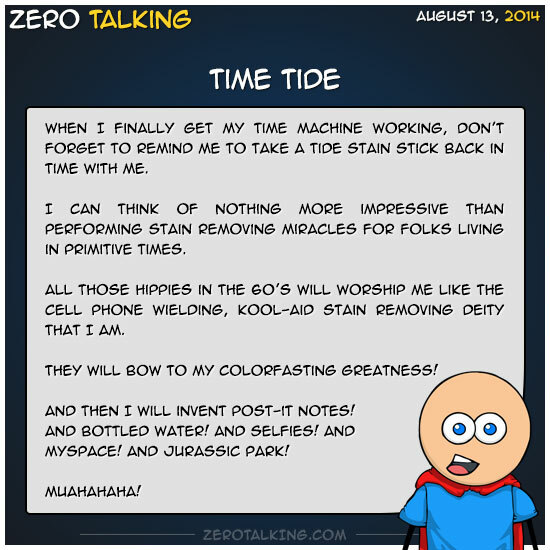 When I finally get my time machine working, don’t forget to remind me to take a Tide Stain Stick back in time with me. I can think of nothing more impressive than performing stain removing miracles for folks living in primitive times. All those hippies in the 60’s will worship me like the cell phone wielding, Kool-Aid stain removing deity that I am. They will bow to my colorfasting greatness! And then I will invent Post-it notes! And bottled water! And selfies! And MySpace! And Jurassic Park!